Located right in the heart of the Las Vegas Strip, the MGM Grand is a majestic sight and the second largest hotel resort complex in the world. The current building opened in 1993, replacing the Marina Hotel which had stood since 1975. As a whole, the casino has gone through some interesting changes over the years. It initially featured a Wizard of Oz theme and a family-friendly amusement park on site before switching to its current Art Deco, Hollywood style. The MGM Grand’s attractions include a famous lion habitat and its casino is the largest in Las Vegas, offering thousands of slot machines, a wide variety of table games including over 100 tables of Blackjack and an enormous Race and Sports Book.The poker room at the MGM Grand is a favorite both among locals as well as visitors from all around the world. It features 22 tables, the majority of which spread No Limit and Limit Holdem, and the area is spacious and comfortable. The staff is extremely courteous and can provide you with anything from a drink to a tableside massage. One of the best features of the MGM poker room is the variety of poker games it offers, including daily tournaments. Texas Holdem cash games are quite affordable, as you can always play games as low as $2-$4 Limit or $1-$2 No Limit. For higher-stakes players, the $500 buy-in No Limit cash game always has action and another interesting variety is /$4/$8 Limit with a kill pot, something rarely seen in a casino. Some beginners lament the fact that there is no bad beat jackpot offered, but this really means that the house takes a smaller percentage of rake from each pot, which really adds up in the long run. 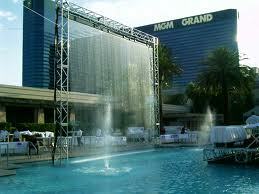 The poker tournaments at the MGM Grand are also extremely popular. Every day of the week there is a $65 buy-in No Limit Holdem freezout at 11am, and Sunday through Thursday there is also an evening tournament starting at 7pm with an $85 buy-in. The availability of low-stakes poker coupled with the fact that the MGM Grand is one of the most noticeable casinos on the Strip makes the level of play comparatively soft, and the games can get downright fishy at times. A large number of beginners use the MGM Grand to test out their budding poker skills, and the table atmosphere is typically quite friendly. For experienced poker players, there is great potential for large profits. You will still be challenged, however, if you manage your bankroll well, and move to some of the bigger games. The daily tournaments offer another type of poker test. You likely won’t encounter as many professionals at the MGM Grand as you might at some of the higher end Las Vegas casinos, but multitudes of poker players gladly make that trade-off for its comfortable environment, inclusive nature and pleasant atmosphere. The fact that the MGM Grand also offers incredible cuisine, world-class entertainment and the largest casino in Las Vegas will give anyone plenty to do in between poker sessions.